Vino Las Vegas is not only about wine but also fine dining and travel. Dining and travel can also be about another beverage known the world over as " Beer ". While attending the Bon Appetit Vegas Uncorked events we had the opportunity to speak to a Master Beer Sommelier and learned the worlds of Fine Beer and Wine are not too far apart. Marc Stroobandt is a Master Beer Sommelier so what a better person to speak to about Beer. We were not even aware there was such a title . Marc first became interested in speciality beers during his first year in law school in Belgium in 1982. In 1998 Marc received world wine acclaim when he was awarded an honorary Knighthood by one of Europe's oldest trade guilds, the La Chevalerie du Fourquet des Brasseurs ( the Knighthood of the Brewer's Mashstaff ) . We spoke with Marc about the steps of beer tasting and Marc agreed it is very similar to wine tasting. Marc suggested we start with a Cabernet Sauvignon glass which really surprised us. No frosty mugs with beers like these ! Like wine , you look at the body and color of the beer. Then on to the "nose" . Marc explained you are looking for many of the same things like the esters. In beer you are looking for the hops and other aromas that set it apart. And yes, like wine, beer has a finish as well. Food Pairing is done exactly the same way as wine. Each course is matched with a beer that either contrasts or complements the dish. We asked Marc about his opinon about what is happening regarding the Food and Beverage industry in Las Vegas. Marc had visited Las Veags several years before. On this visit he agreed that Las Vegas has taken it's place among the world's best culinary destinations and sees no sign of letting up as more and more world renowned Chefs are coming into the city serving world class dishes. It was an education and a pleasure to speak with Marc while he was in Las Vegas. He say he plans to return soon to enjoy more of the Culinary experience of the city. Marc is currently the director and master beer sommelier for the F&B Partnership and lives in London England. In 1968 he made a dry oak-aged Sauvignon Blanc, an unpopular variety in California at the time, and labeled it "Fumé Blanc". The wine was a success and, in time, Fumé Blanc became accepted as a synonym for Sauvignon Blanc. Mondavi successfully developed a number of premium wines that earned the respect of connoisseurs and vintners alike. In 1979, he built the Mondavi Woodbridge Winery in Lodi, California developing it into a leader of popular-premium wines. He also entered into a joint venture the Baron Philippe de Rothschild of Château Mouton Rothschild to create Opus One Winery, and since the 1990s has set up joint ventures with local partners in Europe, South America and Australia. In the Grand European Jury Wine Tasting of 1997, the Robert Mondavi Chardonnay Reserve was ranked number one. In Robert Mondavi was nominated and inducted into the Vintners Hall of Fame by the Culinary Institute of America. The election was based upon ballots from seventy wine journalists. The decision for their election of Mondavi is for contributions to the wine industry of California during his life-time. Inductions with Robert Mondavi on March 7, 2007 included Agoston Haraszthy, Andre Tchelistcheff, Georges de Latour, Charles Krug, Gustave Niebaum, Brother Timothy, Maynard Amerine and Harold Olmo. 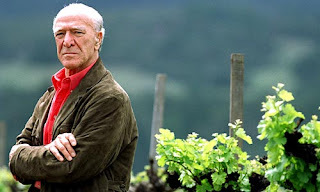 Robert Mondavi died at his Yountville home on May 16, 2008 at the age of 94. We never had the opportunity to meet Mr. Mondavi in person but his legacy will go on forever and all of us in the Food and Wine Industry owe our professional existence to him. Join Vino Las Vegas in raising a glass of California Sparkling wine and say " Thank you Mr Mondavai , Cheers ! wineries. 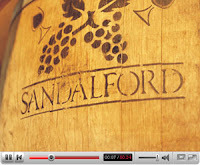 Sandalford offers award winning premium wines. Many of which are allocated. Sandalford's Chief Winemaker Paul Boulden began his career in the 1980's in the the McLaren Vale region of South Australia as a cellar hand with Ingoldby Wines and Thomas Fern Hill Winery. He graduated from the University of Adelaide in 1993 where he won the chemistry award while studying Oenology. In his third year of the undergraduate program he worked as Assistant Winemaker at Tarrawarra in the Yarra Valley of Victoria. He spent his graduate year as vintage Winemaker at Stonier Wines in Victoria under the guidance of Tod Dexter. After completing the vintage of 1993 he accepted a position as winemaker for Chateau Monbazillac in the Bordeaux region in France. His work took Paul to the Penedes region of Catalunya each week to oversee production of both traditional and non-traditional Spanish wines. From Europe Paul returned to South Australia as a winemaker with Yalumba Wines in the Barossa region of South Australia. In 1997 he made the move to Western Australia to a well-known boutique winery, Killerby, located in the Geographe region of the state. 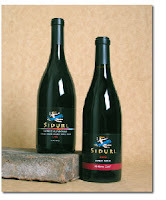 Within a year he also undertook the role of General Manager as well as winemaker. After four years at Killerby he started with the 2001 vintage at Sandalford Wines as Chief Winemaker. At Sandalford he has won consecutively the state's, "Most Successful Exhibitor" at the annual Western Australian Sheraton Wine Awards. Paul also has multiple trophy and Gold medal wine successes at all of the Australian Capital City wine shows, in addition to numerous outstanding wine reviews by the national wine press. His focus has been on developing the premium Sandalford wines from the company's 33-yr. old dry grown Margaret River vineyard, one of the largest and oldest vineyards in this famed wine region. Aside from this he sees the development of the Element range of wines as critical to the ongoing fine reputation of Western Australian wines. summer upon us we can not think of a better wine than this 90% Sauvignon Blanc and 10% Semillon. It has a typical Sauvignon Blanc profile but the Semillon adds wonderful citrus notes that are refreshing on a warm summer day. It also scored a Gold Medal at the Australian National Wine show in 2007. All of these wines really stood out and many are allocated. We here in the Northern Hemisplere are truely lucky to have these premium limited prodcution wines for us to enjoy. in Paris he earned his way into several of France's finest kitchens. Carton with renown chef Alain Senderns. an author as well as a renowned Pastry Chef and has opened Payard Patisseries in Las Vegas, Sao Paulo and Tokyo. The Patisserie and Bistro's design is one of a kind and any guest would enjoy the ambiance. When you enter the front door the custom tile floor with the Payard insignia is worth a look down. But before long you eyes are drawn to the dinning room where the kitchen is located in the middle and guest seated around in a small intimate atmosphere with almost an art-deco style. wine pairing we have had. But now we were ready for what Payard is famous for, desert. And he did not let us down. We actually had a desert tasting consisting of five deserts. Seared Pineapple with Thyme & Coconut Sorbet , Slow Baking Apple, Cardamine Streusel and Granny Smith Sorbet, Milk Chocolate Payard Candy Bar with Gianduja and Caramel Glaze , Palet d Or, Hazenut Succes , Marquise Chocolat and Crispi Wafer. All of the deserts were paired with the Lustau Moscatel Emilin, Jerez Spain non vintage. Chef Payard and his staff did a magnificent job with this dinner. The wine and food pairings were right on target and of course enjoyed the deserts. We will definitely visit this wonderful new restaurant in Caesars Palace often. 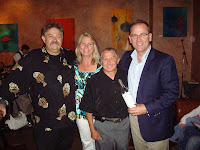 Enjoy a visit to Payard with Elaine and Scott of Vino Las Vegas as we attend the Master Series Dinner for Bon Appetit 's Vegas Uncorked 2008.
restaurant cities in the U.S and Travelocity ranked the city second among the world's top gourmet destinations. It is only natural that Bon Appetit once again, chose Las Vegas as home for one of their most exciting culinary events of the year. Vino Las Vegas is based in this world-renowned entertainment and culinary destination city. Bon Appetit came to town with their Vegas Uncorked for a four day celebration of culinary excellence so we had to stop in for several of these events. into the event took our glasses and paused at the sight before us. We saw legends like Guy Savoy,Wolfgang Puck, Todd English, and Daniel Boulud serving up their best to the guests. icon and also present at this prestigious culinary event. Emeril Lagssee's presence was in the house as well with Table 10's executive Chef Jean Paul Labadie serving his newest creations from the latest Emeril restaurant located in the Palazzo Hotel and Casino. Many of the Bon Appetit staff was on hand as well. Executive Chef Cat Cora was present along with Editor-in-Chief Barbara Fairchild. Ogden, Aureole,L'Atelier De Joel Robuchon, Alize and so many more. Just these names alone can give a "foodie" sensory overload.One of the best parts of this event was most of the "big"names were present to represent their restaurant in person. and say how much you enjoy their creations. more Master Sommeliers in Las Vegas than any other city. now with AAA Five Diamond Award winners and recently the prestigious Michelin Guide awarding the only three star rating to Joel Robuchon at the MGM Grand for Las Vegas and Los Angeles, lets Las Vegas take its right full place among the world's best culinary cities. 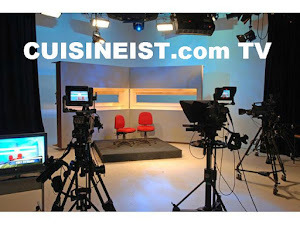 Take a slip and stroll with Elaine and Scott of Vino Las Vegas as we talk to a few Chefs, winemakers and sample some culinary creations we will not soon forget. When you bring a publication like Bon Appetit ,the worlds best chefs, add some celebrities and put them in a culinary city like Las Vegas you are in for a treat. that had be the focus of the dish. And to make it more interesting, the meal would be judged by a panel of culinary experts and in front of a live audience. tabs on the teams as they created their dishes within the 30 minuet time frame. they would use Lobster as it is fairly common and not to mention one of the competing chefs is renown world wide for his seafood. to believe these dishes were done within 30 minutes without knowing the "secret" ingredient. prevailed in a very close vote by the esteemed panel of judges. out the help of actor John O' Hurley. After a tough battle and alot of laughs from the John O' Hurley team, Bartolotta was declared the winner. In a competition like this we all winners to be able to see culinary talent like this put to the test. Join VINO LAS VEGAS as we watched both of these incredible competitions unfold at the Culinary Pro-Am 2008 Bon Appetit's Vegas Uncorked. Double Helix Wine Bar and Boutique in the Palazzo Hotel Casino. and make a great wine making team. To quote their website , " By focusing solely on Pinot Noir from the most prestigious vineyard sites in California and Oregon, and by vinifying each barrel separately by lot, clone, yeast and cooper, we champion individuality of place and intensity of flavor in each wine we produce ." vineyard specific labels read like a who's who of California vineyard owners and wine growers. minutes talking with them about their past and future plans. and events located right on the Fabulous Las Vegas Strip. Winemaker Richard Oh recently made a stop in Las Vegas. While in town , Richard joined Vino Las Vegas for lunch and to talk about the release of OH Wines Pinot Noir 2006 Santa Lucia Highlands. 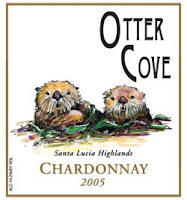 Under the Otter Cove label Richard produces Gewurztraminer, Resling , Syrah , Merlot and Pinot Noir varietals. They all have a designation from either Santa Lucia Highlands or Monterey County. 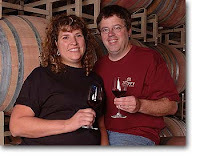 We had the opportunity to try the Otter Cove wines last year and were pleasently surprised. 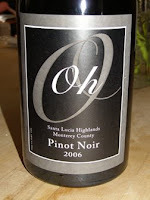 On this occasion we tried OH Wines Pinot Noir 2006 Santa Lucia Highlands that has just been released. On the nose we were greeted with the classic aromas of cherry and spice .In the glass the wonderful burgundy color shinned and led us to the palate where cherry, black fruit and spice came through. The finish was unique in that in had a little more tannins than we would expect. This however is a good thing as this great Pinot should hold up in the bottle very well. Richard has done a great job producing his other varietals under the Otter Cove label and we expect he will do the same with his new label of OH Wines. Like most of his fellow winemakers in Monterey County you can taste the labor and passion that has gone into making these wines. Richard likes to experiment with aromas and flavors to produce some classic varietals with his own unique twist. It is very good to see young winemakers such as Richard really begin to come into their own by making quality wines that are recognized by experts in the Food and Wine industry worldwide. 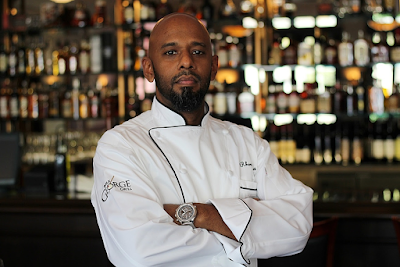 to the 18th annual Epicurean Affair which features the best of Las Vegas's Food and Beverage Industry. really showed the world the diversity Las Vegas has to offer in Food and Beverage. Savoy , Michael Mina and Andre Rochat. Many of these Chefs have been awarded the coveted Michelin Stars and attendees could sample the cuisine that is known world wide. present to temp us with their beverage creations as well. around the pool sampling the food and beverages. the world as a major entertainment destination. go shopping in designer stores by day. Have a great lunch poolside prepared by the well trained resort culinary staff of the many hotels. is truly a memorable experience and should not be passed up. musicals. There is something available 7 days a week. world to experience these clubs with multiple levels, music and sensory experiences. become and will continue to evolve into. Las Vegas has to offer.